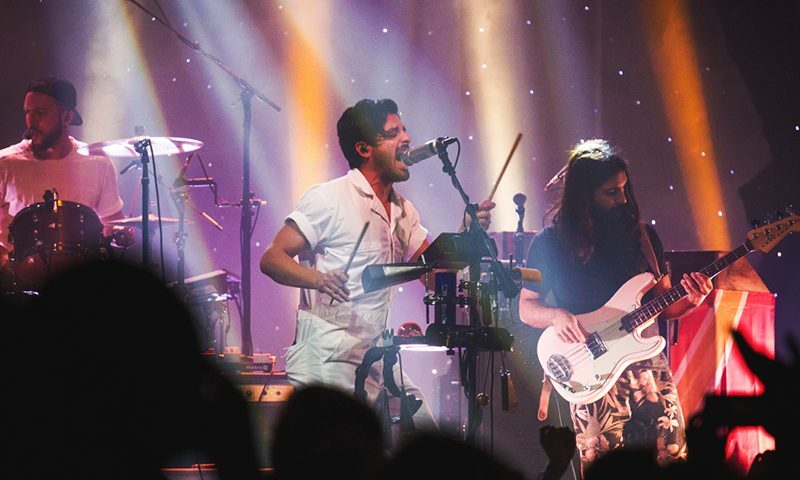 Young the Giant’s Sameer Gadhia moves to his own personal rig of noise, complete with a cowbell and all. Photo: Talyn Sherer. If there were ever a soundtrack to define the 2010s, Young the Giant would surely appear at the top of that list. 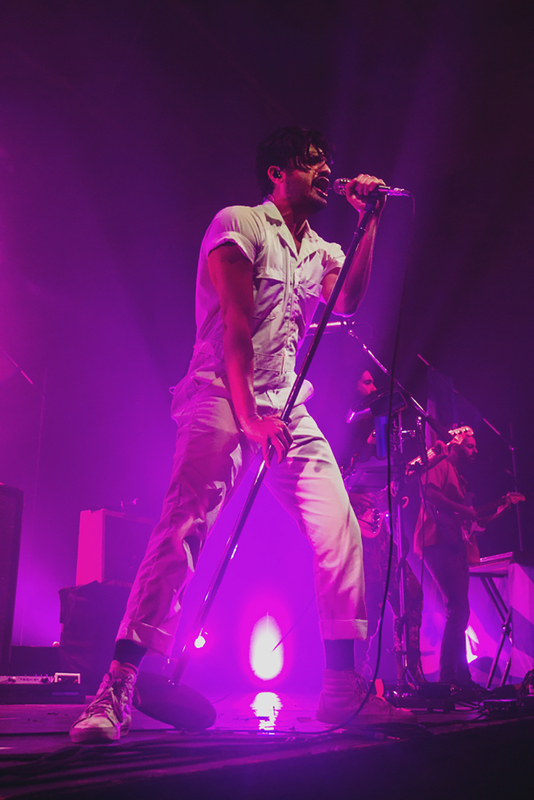 Formerly known as The Jakes, Young the Giant quickly became a household name in 2010 when their hit song “My Body” shot straight to the top of the Billboard Alternative Songs chart. Since then, they have been met with wave after wave of success. 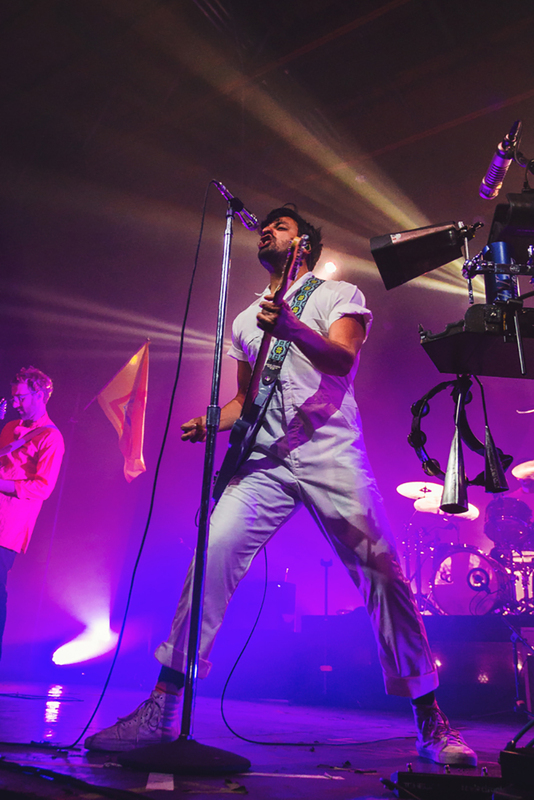 A purely musical melting pot of culture and sound, Young the Giant are staffed with members of different backgrounds, from Persian to Indian to French to English. Sameer Gadhia helped form the band after he put a halt on his studies at Stanford University, where he was studying medicine. While it was a huge risk to put school on hold, the world has benefitted for it, as his music has helped shape the current generation. Saturday night was like a watching a musical dissertation take place before our eyes. 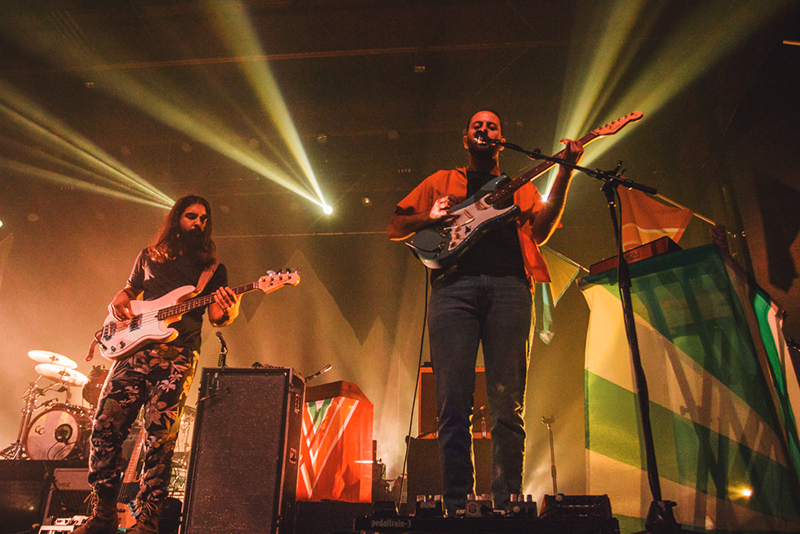 With opening act Lewis Del Mar showcasing their unique and stylistic sound, and Young the Giant massaging the eardrums of every head in the crowd, the complete euphoria of the event was groundbreaking. 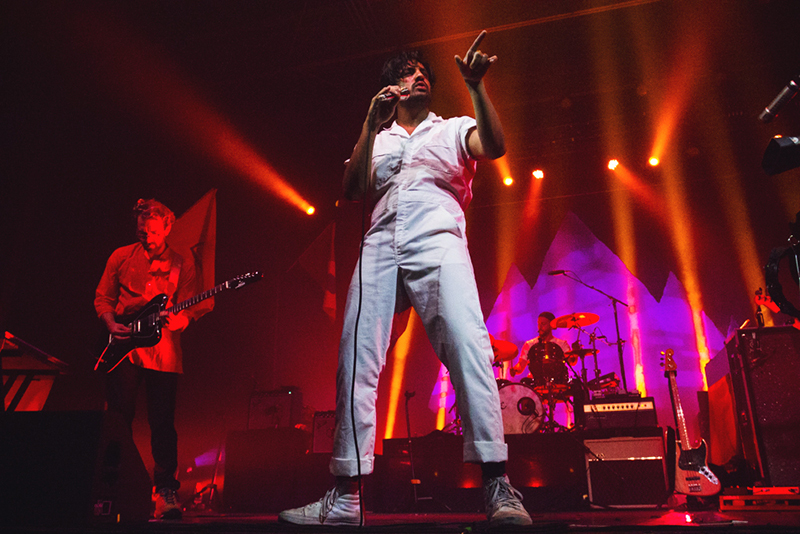 The sold-out show at The Complex was of no surprise to anyone who has followed the success of Young the Giant, as each album they produce seems to be riddled with hit song after hit song. 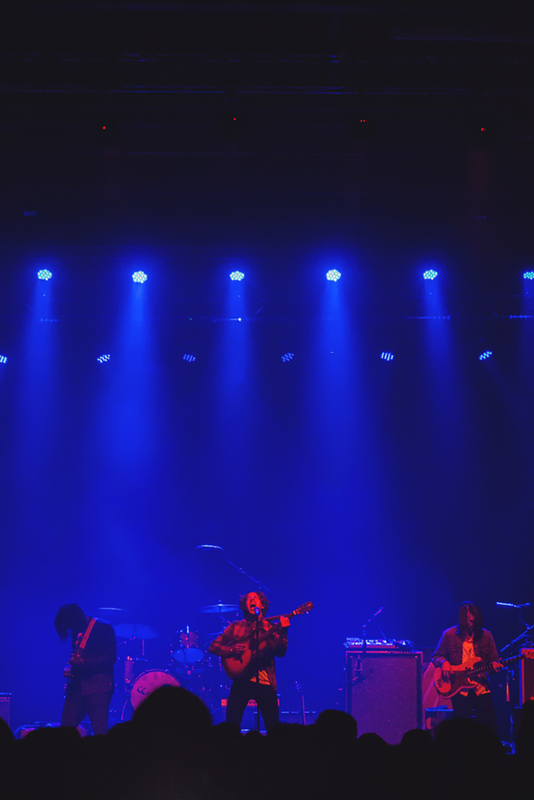 Their latest album, Home of the Strange, has proved itself to be one of the best albums the band has released to date, and seeing it performed live is a bucket list–worthy experience that everyone should check off. 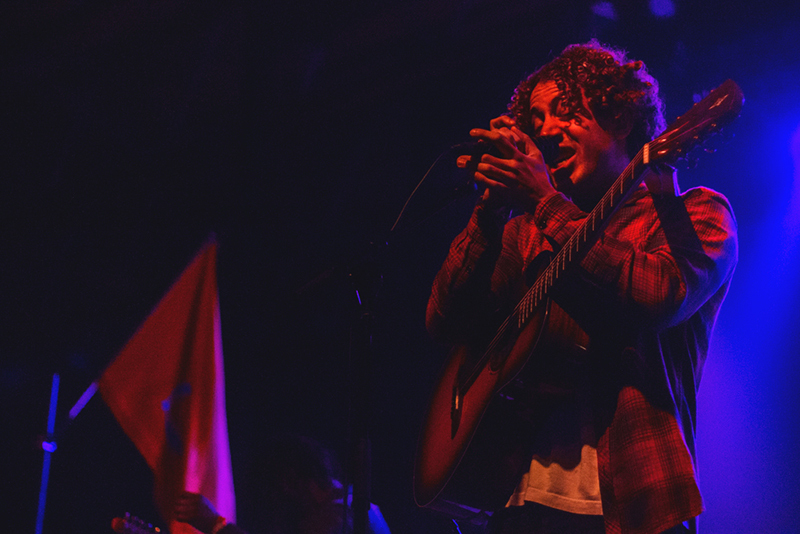 Lead singer Danny Miller of Lewis Del Mar gets intimate with the microphone. Photo: Talyn Sherer. 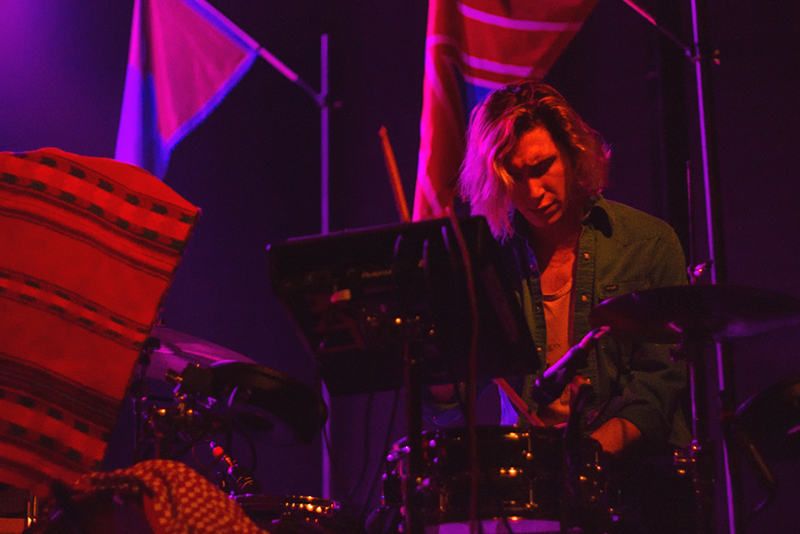 Max Harwood of Lewis Del Mar is one of the band’s central figures and founding members. Photo: Talyn Sherer. Lewis Del Mar’s lead singer/guitarist Danny Miller feels right at home in Salt Lake City. Photo: Talyn Sherer. 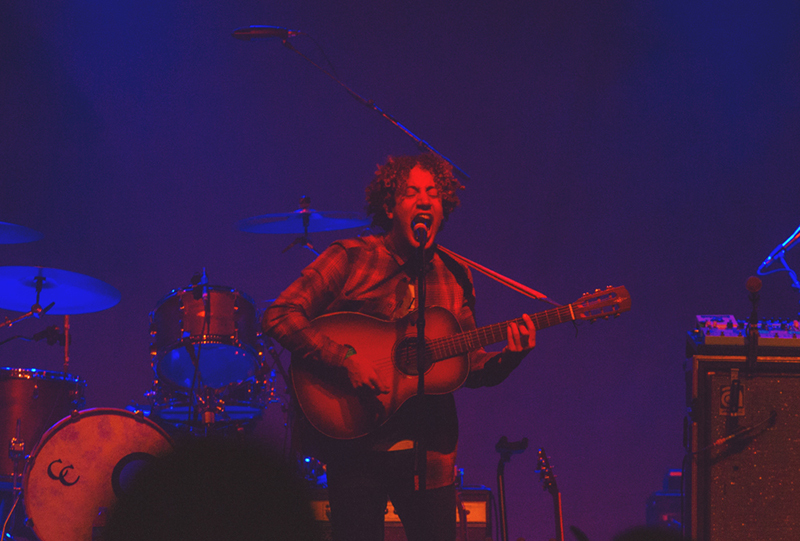 Danny Miller of Lewis Del Mar belts out an elongated note that gets the crowd cheering. Photo: Talyn Sherer. 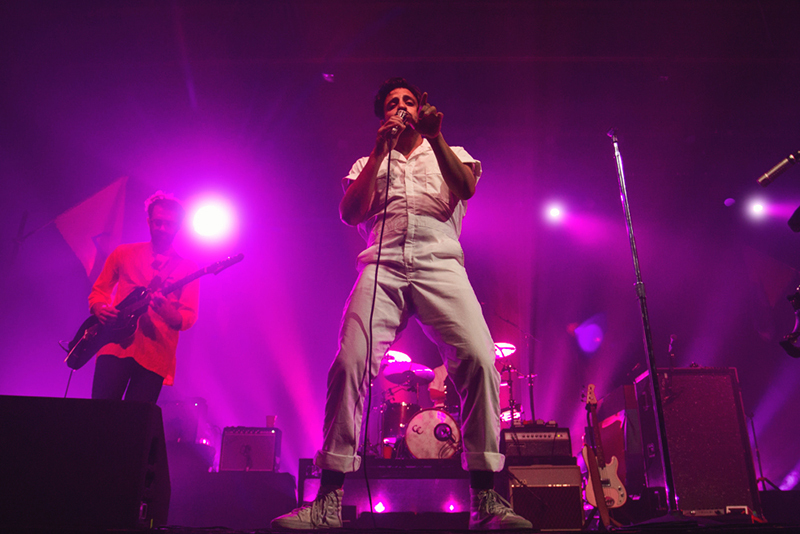 Lewis Del Mar opens the night with a sound that seems like the perfect pairing for Young the Giant’s headlining performance. Photo: Talyn Sherer. 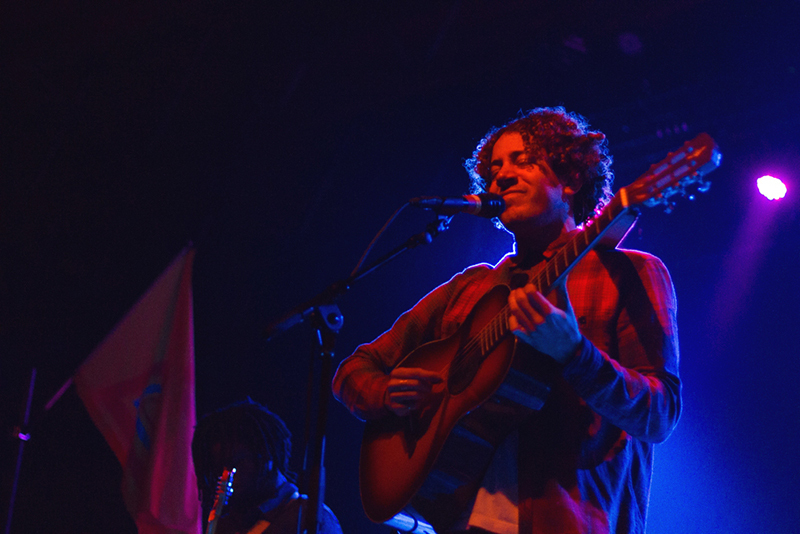 Danny Miller of Lewis Del Mar has a voice that echoes throughout the whole venue without the accompaniment of the sound systems. Photo: Talyn Sherer. Sameer Gadhia of Young the Giant comes out swinging while the crowd below can barely contain their excitement. Photo: Talyn Sherer. 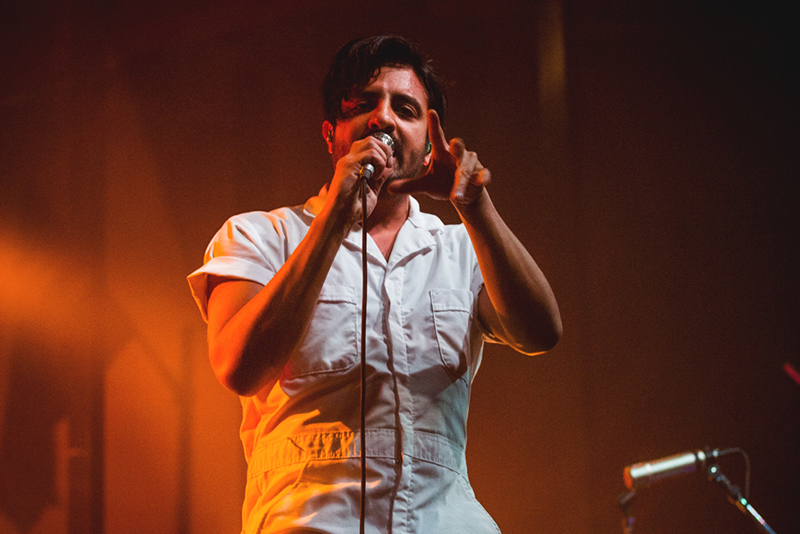 Sameer Gadhia of Young the Giant is a performer in a league of his own. Photo: Talyn Sherer. 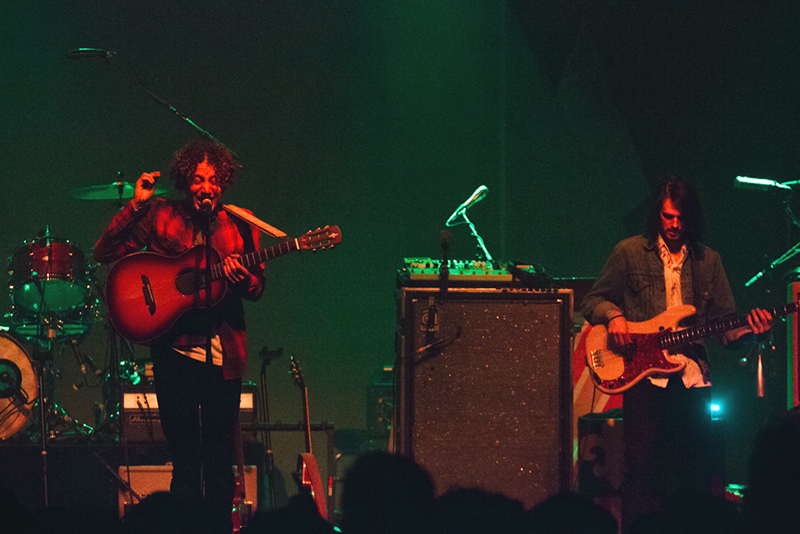 (L-R) Payam Doostzadeh and Eric Cannata of Young the Giant perform under golden lights at the The Complex SLC. Photo: Talyn Sherer. 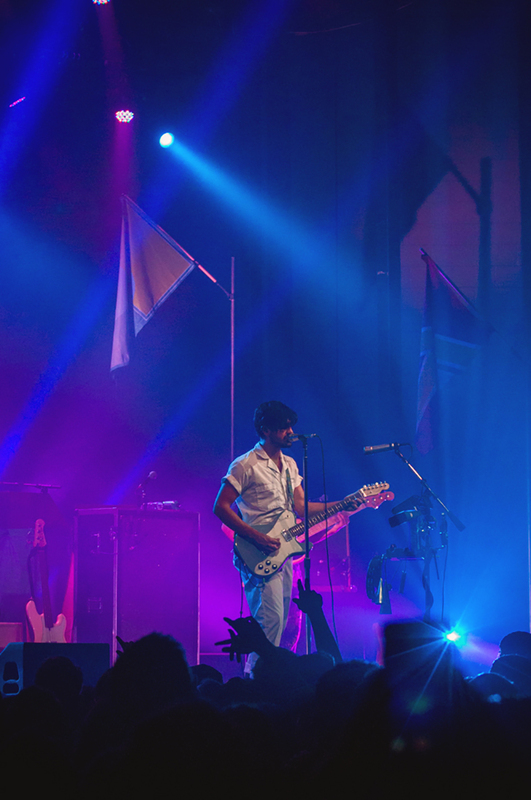 Sameer Gadhia of Young the Giant shoots a quick glance to the crowd as they sing along with every note. Photo: Talyn Sherer. 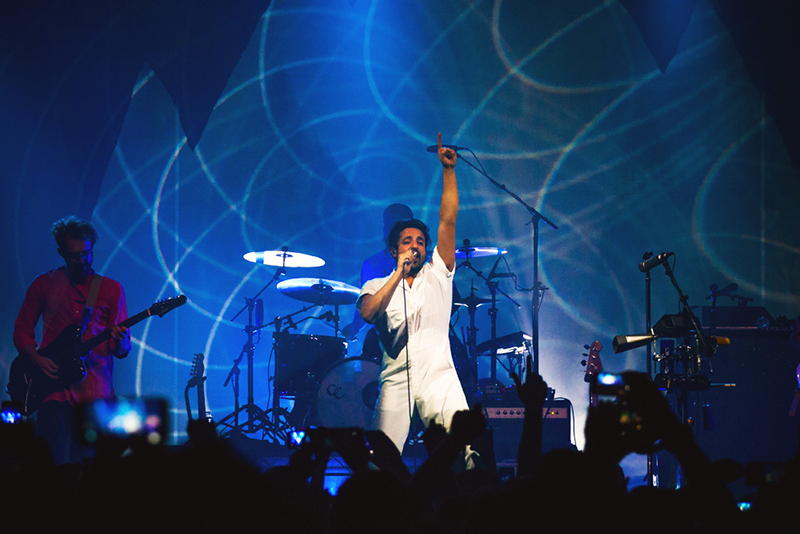 Young the Giant’s frontman Sameer Gadhia is by far one of the most energetic and eccentric singers to grace the Complex stage. Photo: Talyn Sherer. 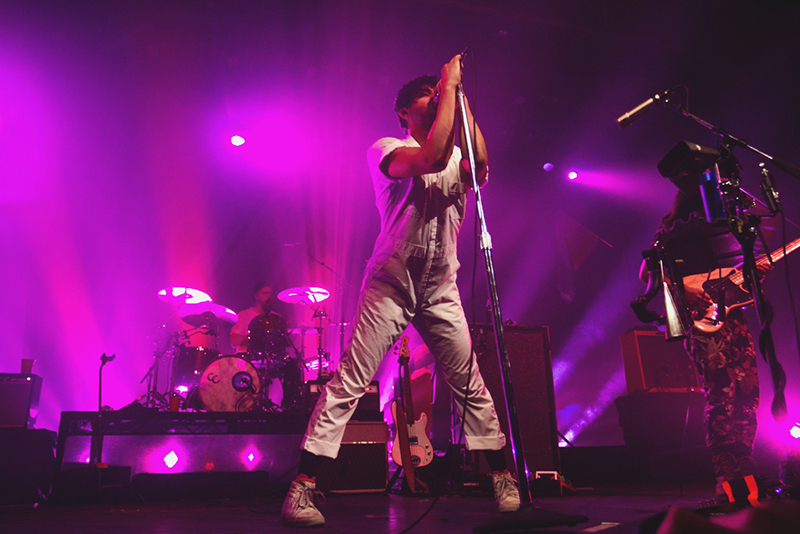 Young the Giant lead singer, Sameer Gadhia, is never shy about striking a pose. Photo: Talyn Sherer. 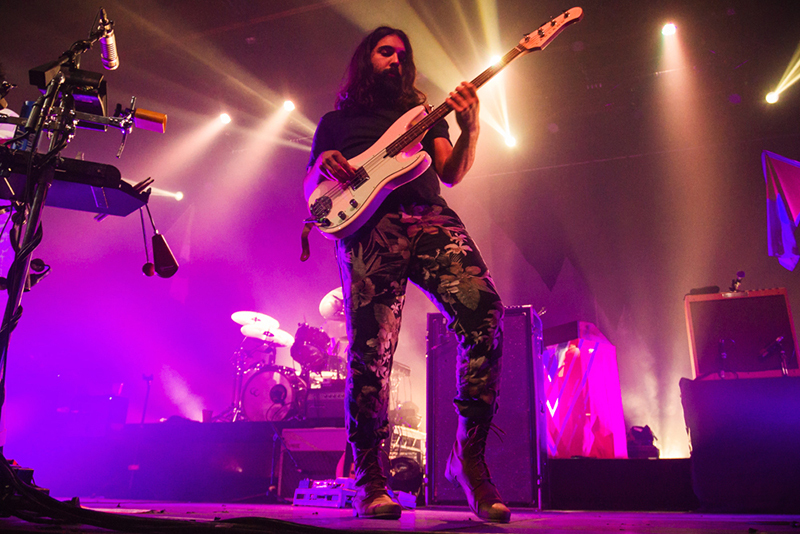 Payam Doostzadeh is known for his skilled bass playing through both a stringed instrument and an electronic bass machine. Photo: Talyn Sherer. 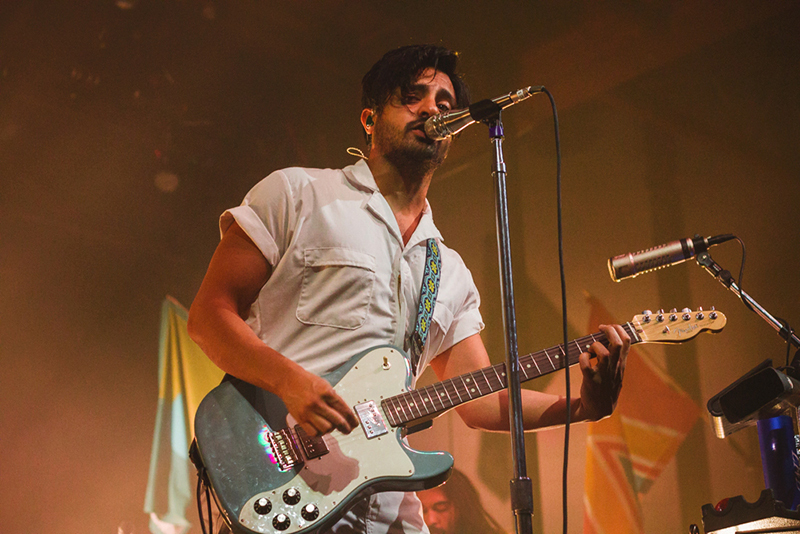 Sameer Gadhia of Young the Giant looks right at the camera and sings just for me. Photo: Talyn Sherer. Young the Giant’s sold-out show proved to be one of the best and most highly-attended shows that I have seen at The Complex thus far. Photo: Talyn Sherer. 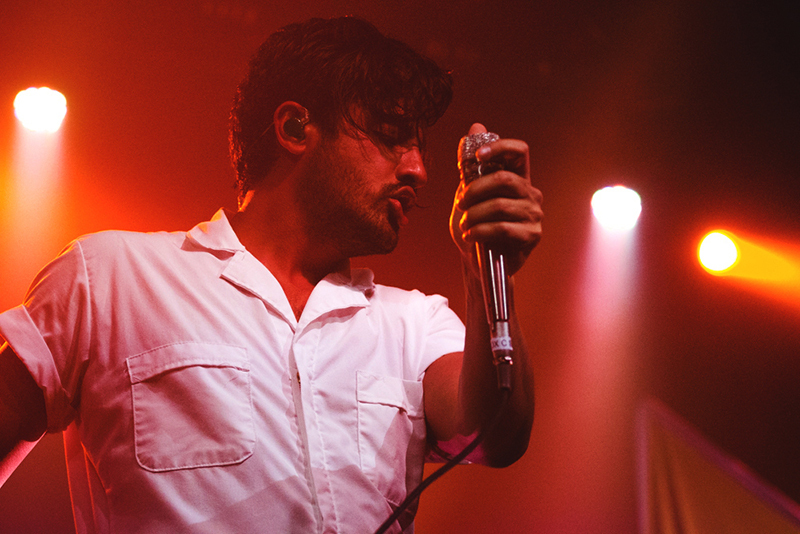 Jacob Tilley of Young the Giant stares intently at the sea of people screaming beneath him. Photo: Talyn Sherer. 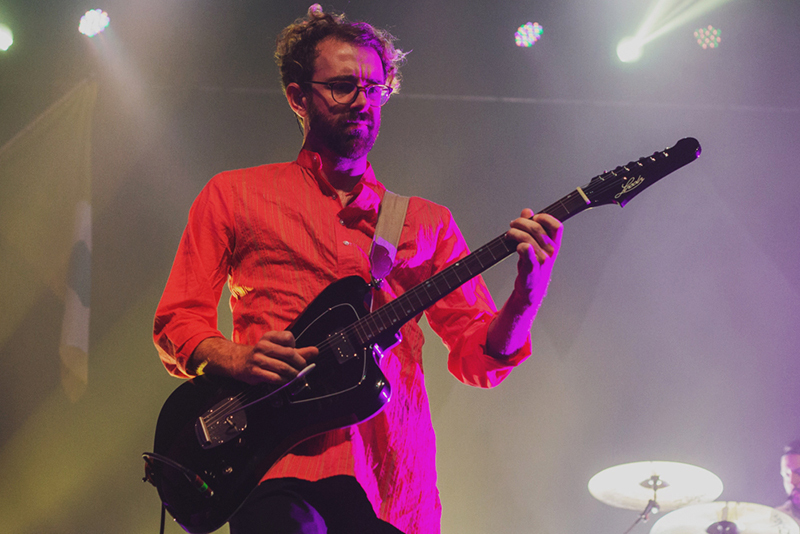 Jacob Tilley of Young the Giant slowly transitions into the magenta lights on stage. Photo: Talyn Sherer. 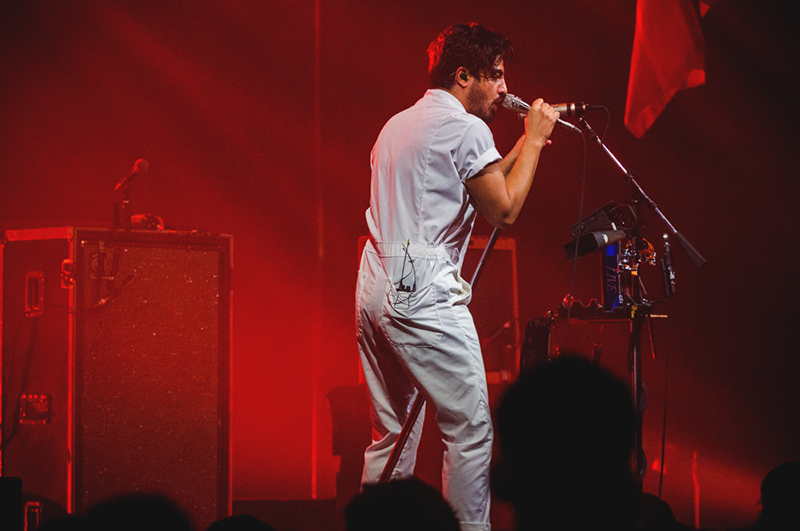 Sporting the white jumpsuit and thin-lines mustache, Sameer Gadhia of Young the Giant is both a fashion icon and musical legend. Photo: Talyn Sherer. 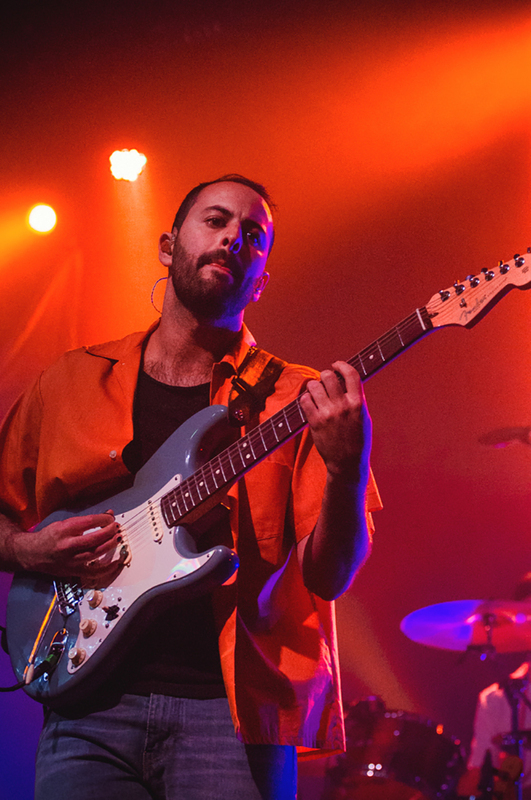 Eric Cannata of Young the Giant sports the blue Fender guitar that is a staple in the music industry. Photo: Talyn Sherer. 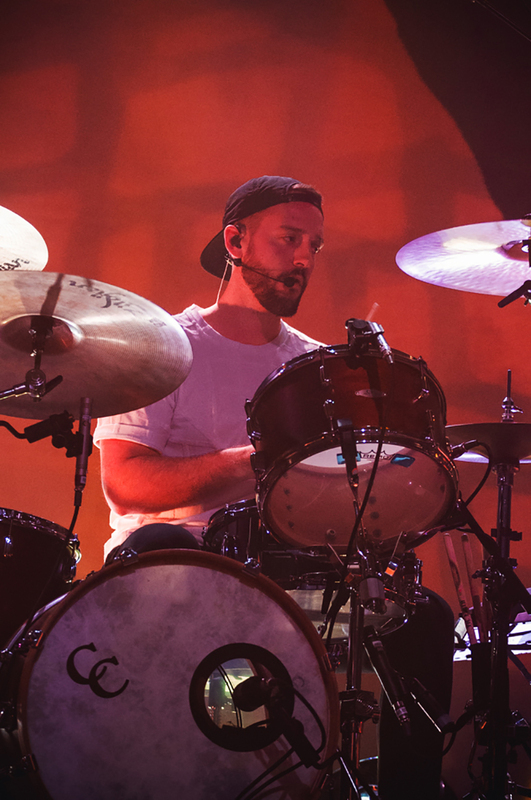 Young the Giant drummer, François Comtois, cranks out the edgy tones from center stage. Photo: Talyn Sherer. 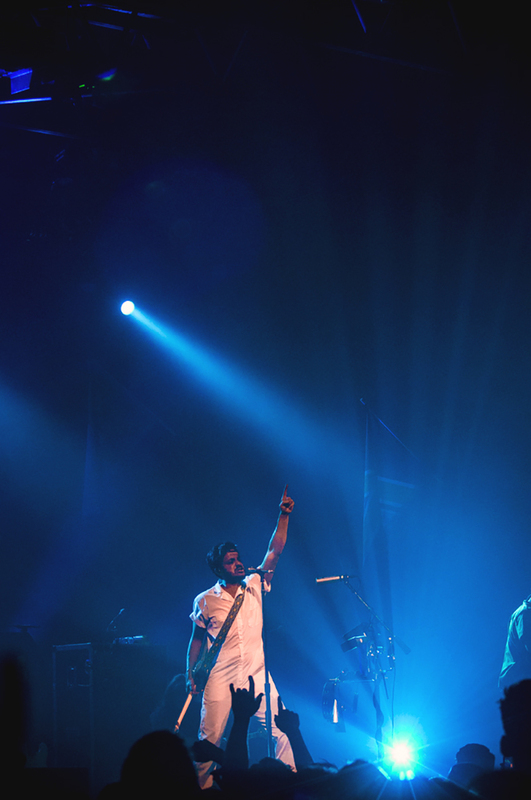 Young the Giant’s lead singer, Sameer Gadhia, begins to cast his musical spells on the crowd below. Photo: Talyn Sherer. 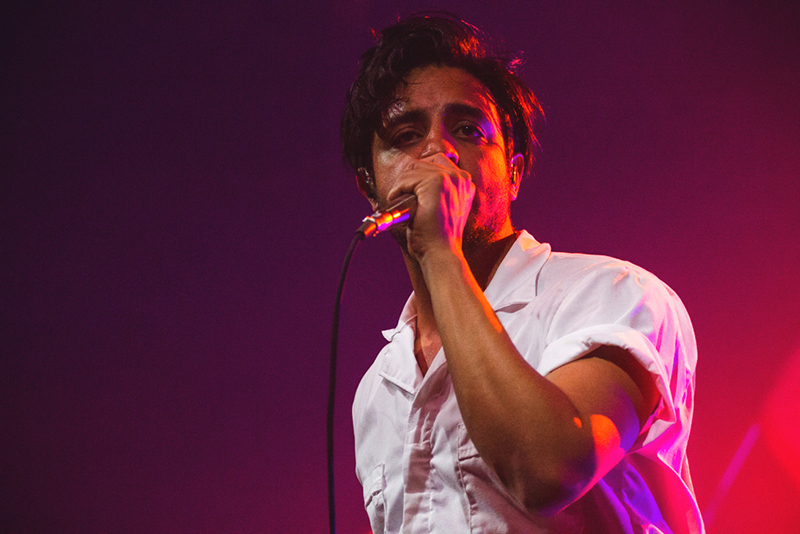 Sameer Gadhia of Young the Giant is in complete disarray after seeing the size of the crowd in Salt Lake City. Photo: Talyn Sherer. 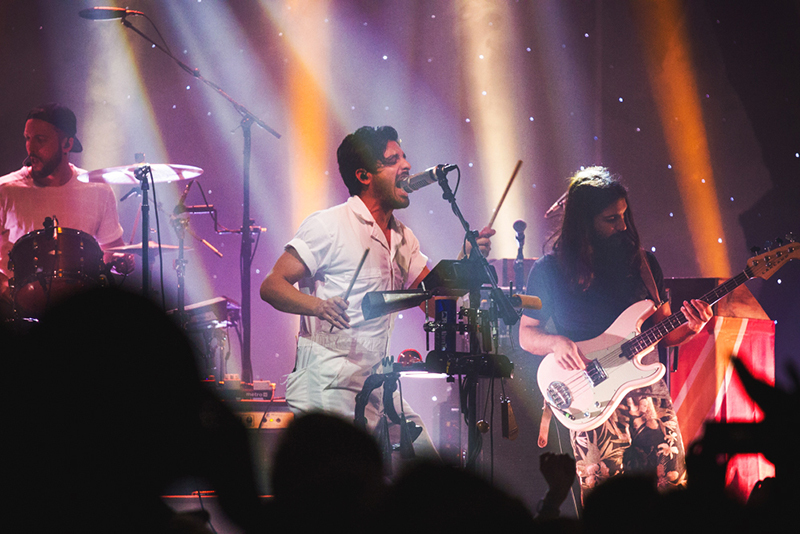 Sameer Gadhia of Young the Giant lets the soul of the music take over the soul of his body. Photo: Talyn Sherer. 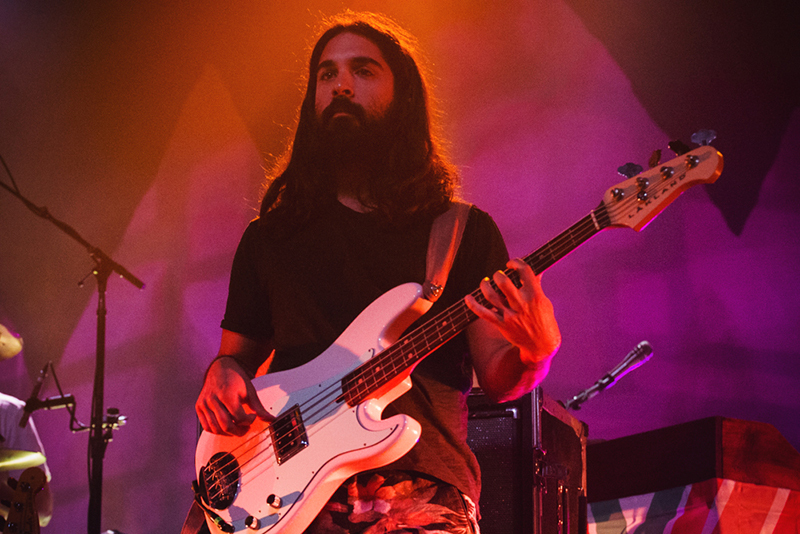 Don’t let Payam Doostzadeh’s stoic presence fool you, as his crunchy bass lines are far from being unflappable. Photo: Talyn Sherer. 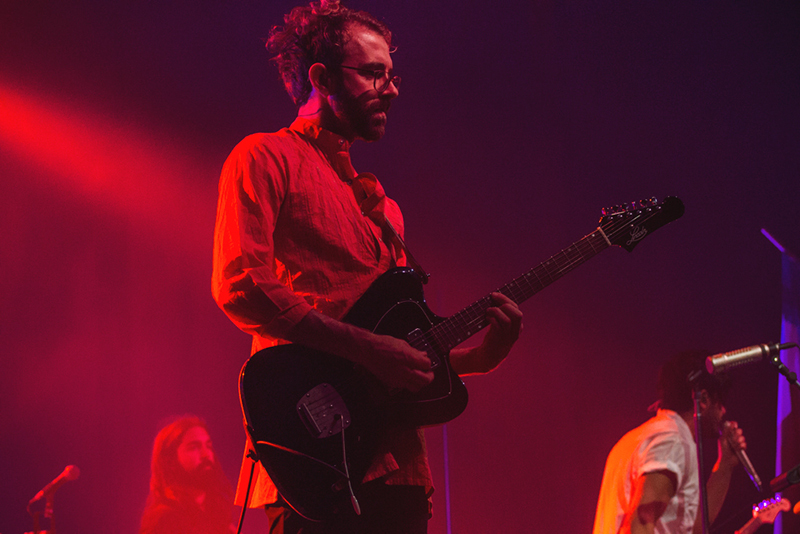 Sameer Gadhia looks off in a brief moment of curiosity while performing with his band Young the Giant. Photo: Talyn Sherer. 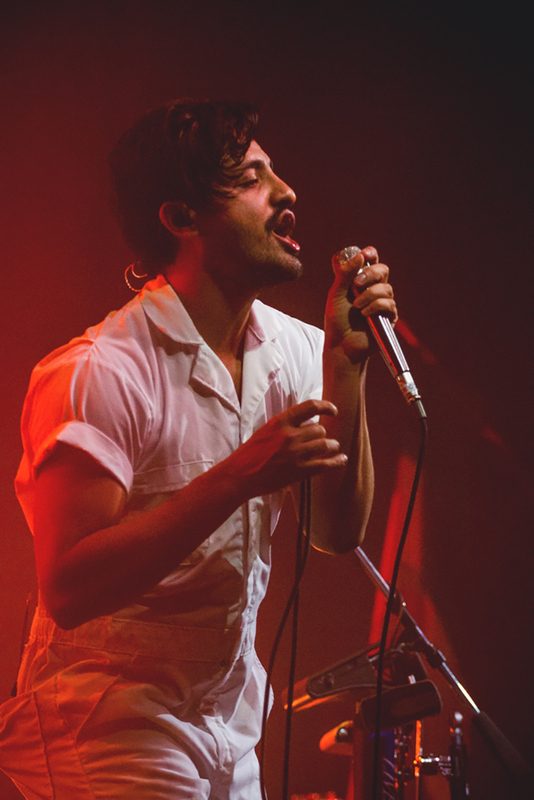 Sameer Gadhia of Young the Giant begins to whisper sweet little nothings into the microphone. Photo: Talyn Sherer. 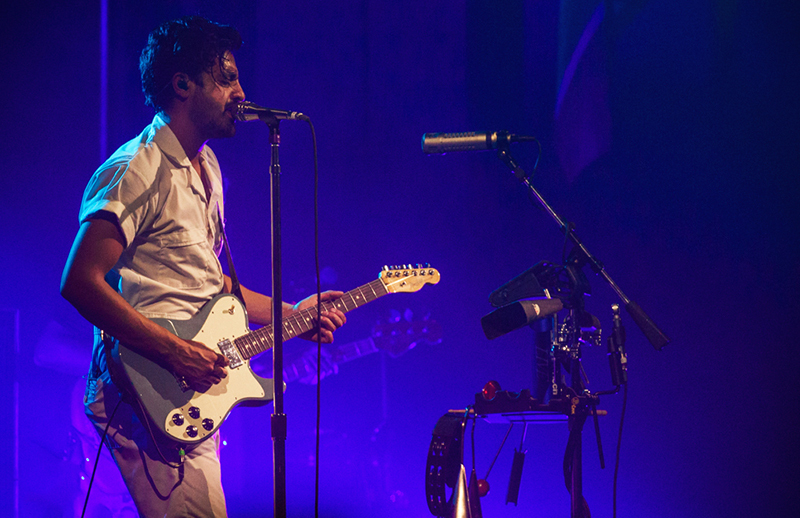 Under the purple and blue lights, Young the Giant calms our nerves with a down tempo song. Photo: Talyn Sherer. Sameer Gadhia gives us a Freddy Mercury–esc pose as the crowd screams their hearts out. Photo: Talyn Sherer. 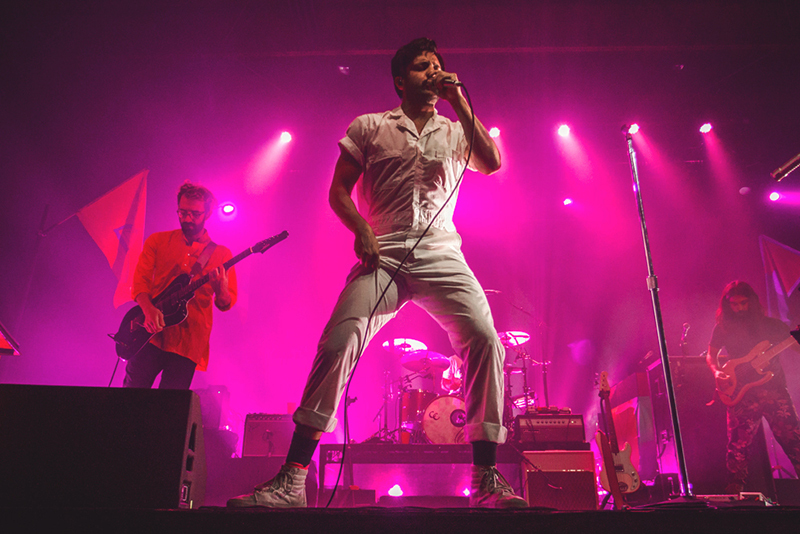 The crowd erupts as Young the Giant performs “Mind Over Matter.” Photo: Talyn Sherer. 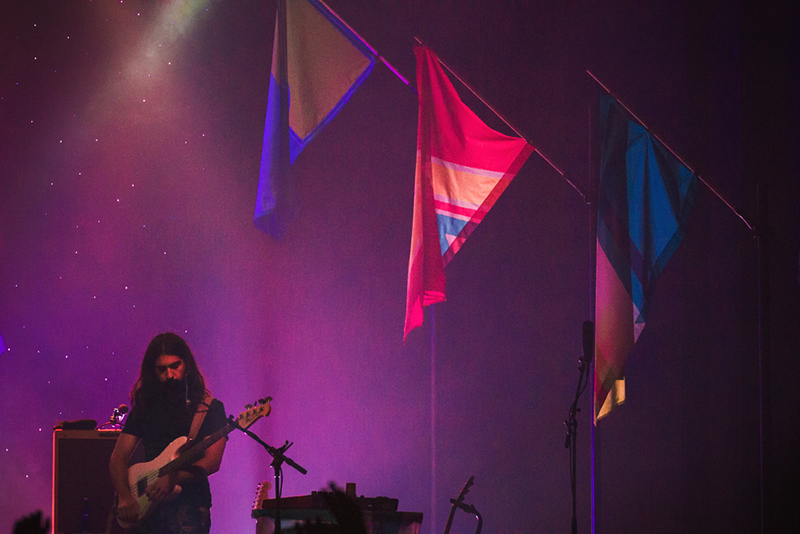 Payam Doostzadeh of Young the Giant plays out the bassy notes under the band’s signature flags from their latest album. 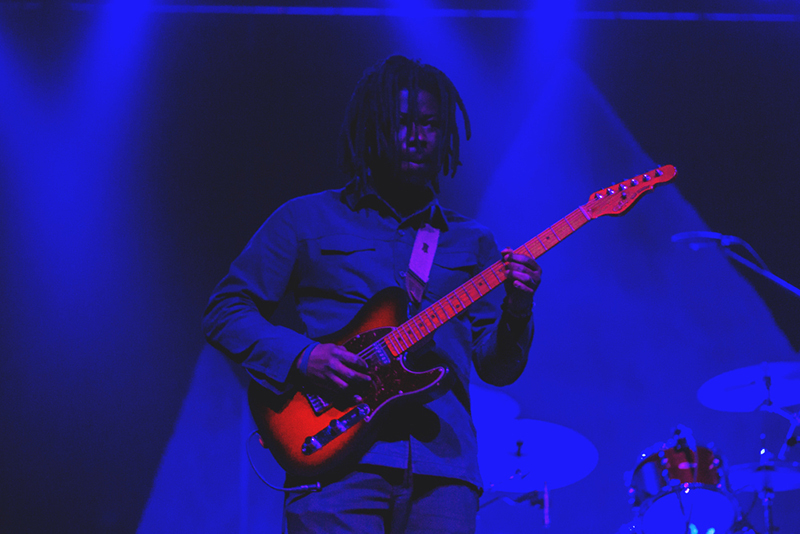 Photo: Talyn Sherer. 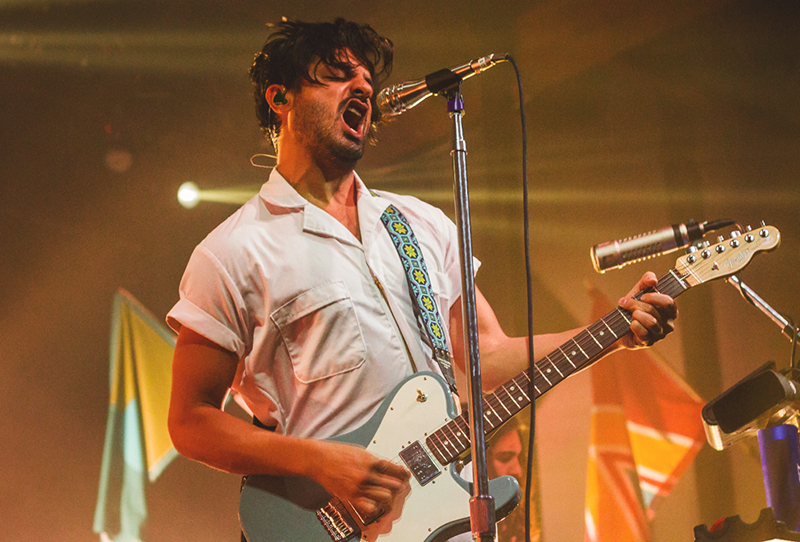 Sameer Gadhia of Young the Giant wears his emotions on his sleeve as they perform a track off of their latest album, “Home of the Strange.” Photo: Talyn Sherer.